Short on time? Follow this link to a Google Maps version of our guide for 2 days in Melbourne with all of our favorite spots labeled! You can “follow” the guide, and the saved locations will automatically transfer to your own Google Maps account. When Tyler and I visited my little sister Miriam in Australia last summer, we started in Sydney, then flew to Adelaide, and finished up our trip with two days in Melbourne. Our time in Australia was tiring but amazing. We fell in love with every stop we managed to squeeze into our week and half long trip. Do I recommend an international trip that requires a 15 hour flight at almost 6 months pregnant? Not really. But why not go out with a bang before having a baby? (I would have honestly never done it had we not been saving our international business class upgrade vouchers for a time such as this–see the “leverage your work” section of our “How to Travel without a Trust Fund” post). Melbourne is, in a word, HIP. We camped out in the CBD for the majority of our time and had a blast going coffee shop and bookstore hunting. I think our favorite part of Melbourne was the food (shocking for us to focus on this, I know). Tyler and I had some really incredible meals that I’ll share more about below. We also ventured down the coast one of the days and discovered some really beautiful areas. Australia is, in case I haven’t stressed this enough, just insanely beautiful. We did rent a car because we knew we wanted to take the drive down the coast. And we also just wanted to make this trip as easy as possible on me and my baby bump, so we rented cars on every stop of this trip. That being said, we only used the car going to and from the airport and then on our day trip. Bookmark this guide for some helpful info about getting around Melbourne via public transport. I have to say that our hotel choice was flawless here. The Adelphi Hotel was amazing. Located in the heart of the CBD, this boutique hotel has some of the most creative decor I’ve seen. The staff was so welcoming and helpful, and the entire vibe of the Adelphi Hotel was luxurious with “obsessive attention to detail” (per the hotel’s website and I couldn’t have said it better myself). Rooftop pool, bar, and a gourmet restaurant, just to name a few of the features. This was the perfect choice for a weekend in Melbourne, and we paid for it entirely in points! Win, win. A must on any Melbourne itinerary, Federation Square is the cultural hub of the city and home to galleries, restaurants, and events. Grab a cup of coffee and enjoy the atmosphere and prime people watching. Then, head towards the Yarra River and make your way towards Melbourne Park. The walk is beautiful and a really great way to see both sides of the cityscape. While I don’t know everything about the sport, I consider myself a tennis fan. I grew up watching all of the Grand Slams with my mom, who doesn’t miss a set and knows the record, childhood history, and personality quirks of every ranked player. One of my absolute favorite things to do is curl up with a coffee and watch my first love, Rafa, do what he does best on the clay court. 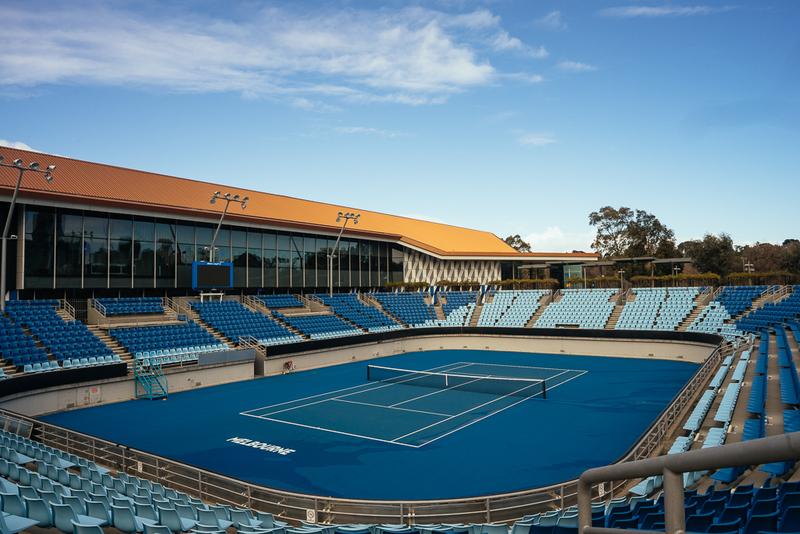 As you can imagine, I was PUMPED to visit Melbourne Park, home of the Australian Open. Though there weren’t any tours running on the day we went, we still loved walking the ground ourselves. Tours are now open on Monday, Wednesday, and Friday a few times per day and give visitors a glimpse into the players’ lounge, training areas, and underground paths (more info here). Melbourne is famous for its painted laneways, tiny alleys that run perpendicular through the main streets. We had a blast strolling through and looking at all of the street art. One of the most popular is Hosier Lane and conveniently located right by the Adelphi Hotel. I LIVE for a bookstore and LOVE bringing a book (or 5) home as my souvenir. I’m a sucker for an old fashioned stamp in the front cover, and I always write the date and city where I bought the book. (A few of my all-time favorite shops have been Persephone in London, Libreria Acqua Alta in Venice, and of course Shakespeare and Company in Paris). Tyler knows the drill. I have to find at least one of the best bookstores in every city we go to, and he knows to give me at least 20 minutes to peruse in peace. And then he also knows that he will have to carry around whichever volume I settle on. But then I take him to get his beloved afternoon coffee, so it all evens out. Visiting Hill of Content was no exception. Beautiful selection of books, helpful staff, and a number of comfy chairs for patient partners to cozy up on. I purchased Little Fires Everywhere, as featured on last summer’s reading list. Definitely recommend this spot for fellow traveling bookworms. This was such a fun day. We grabbed a coffee from Duke’s, hit the road early, and traveled first to St. Kilda, a little way’s south of the CBD in Melbourne. We couldn’t stop ourselves from picking up a couple of cakes from Monarch Cakes and swinging by Readings bookstore. Then we walked down the pier (SO gorgeous even though it was very cold) and searched for penguins in the rocks. We only saw one teeny tiny one (just our luck, wildlife eludes us all over the world), but apparently on other days you can see tons. Then we drove down to Brighton Beach, another Insta-famous hotspot in the area. The colorful bathhouses on the beach were just as cute in person, but of course the beach was crawling with tourists like us. We’d probably try to hit it even earlier in the morning had we known it would be so crowded. Melbourne has a TON of amazing spots to eat, so we had a hard time choosing for each meal. The CBD is full of fun and creative restaurants, but we visited a few standouts. Chin Chin: This was our favorite by far. The wait at this chic and modern southeast Asian restaurant was insane but so worth it. We ended up sitting at the bar and ordered the pad seuw and massaman curry–both incredible. +39 Pizzeria: As we all know, I ate pizza multiple times a week during my pregnancy, so this was a very appropriate choice for our last night in Melbourne. We loved the “diavola” pizza that we ordered. Chuckle Park: Not going to lie, I found this place on Instagram, but it turned out to be a perfect spot for a quick sandwich and place to regroup. Eau De Vie: I have the bookshop thing, and Tyler has a speakeasy thing. He has to find one in every city we go to, and he lives for the thrill of hunting them down and pretending like we are cool enough to get in. Eau De Vie was actually one of our favorites. We sat at the bar and watched the mixologists in awe as they expertly crafted cocktails for the rest of the way-cooler-than-us patrons at this hidden bar. Ponyfish Island: This was the ideal spot to kill some time before dinner. Ponyfish Island is a cool bar that’s tucked under a bridge and is the perfect way to enjoy sunset over the city sitting right on the water. Pellegrini’s Espresso Bar: This is your no-nonsense but very necessary Italian lunch stop. Order a plate of carbara and an espresso to get you through the rest of your day.